Texting While Driving Accident & Injury Attorney | Maggiano, DiGirolamo & Lizzi P.C. Texting while driving is one of the most serious dangers facing American drivers today. The National Safety Council estimates over 25 percent of all car accidents in 2012 involved talking on the phone or texting, adding up to at least 1.48 million phone-related crashes. More than 420,000 people were injured in distracted driving-related crashes in 2012, and 3,328 people were killed. A federal study found that texting while driving is six times more dangerous than driving under the influence—but drivers continue to text behind the wheel at an alarming rate. Texting-related accidents are particularly devastating because they are entirely preventable. The choice to text behind the wheel puts countless other drivers and passengers at risk, and the problem continues to grow—despite widespread knowledge of how dangerous it is. Since the first texting ban was passed in Washington in 2007, 44 states have outlawed texting while driving, and 14 states (including New Jersey and New York) have banned hand-held cell phone use of any kind. President Barack Obama also issued an executive order banning all federal employees from texting while driving, and employers of all industries, sectors, and sizes are beginning to follow suit. A survey from the National Safety Council found that nearly three-quarters of Americans favor harsher penalties for texting while driving. If you or a loved one have been seriously injured due to texting while driving, you could have grounds for a personal injury case to recover your losses. Maggiano, DiGirolamo & Lizzi have more than 80 years’ worth of experience fighting for the injured in New Jersey and New York, and our skilled lawyers have collected more than $300 million in compensation for our clients. We have the experience and resources to see your claim through to the very end and hold the negligent party accountable for their actions. Call (201) 585-9111 or contact us online to speak with one of our experienced personal injury attorneys today. Technological advances and the rapid rise of the cell phone are having an unprecedented effect on driver safety. At any given moment, approximately 660,000 drivers are using cell phones or manipulating other electronic devices behind the wheel, according to estimates from the National Highway Traffic Safety Administration. Reading and sending text messages while driving makes a crash 23 times more likely, far outpacing dialing a phone number (2.8 times more likely to crash) and talking on the phone (1.3 times more likely). Of all distracted driving activities, texting while driving takes the driver’s eyes off the road for the longest amount of time: 5 seconds. While traveling at 55 mph, 5 seconds is enough time to drive the length of a football field blindfolded. And while many drivers are confident that they can safely text while driving, research has shown that teenagers who text while driving spend approximately 10 percent of their driving time outside of their lane. Young drivers, who tend to be more involved with technology, certainly make up their fair share of the texting-while-driving epidemic. Approximately 13 percent of drivers 18-20 involved in car accidents admit they were texting or talking on the phone at the time of the crash. The University of Michigan Transportation Research Institute found that one-quarter of teen drivers respond to a text message at least once every time they drive, and 20 percent of teens admit to having multi-message text conversations while driving. Data from an AT&T survey estimates the true number is much higher, with 50 percent of teens admitting to texting while driving. However, the problem is not restricted to young drivers. Just under half (43 percent) of adult drivers admit to texting while driving, and over half say they only started texting while driving in the past three years. A major issue with adults texting while driving is the example they set for their children and other passengers; 48 percent of children 12-17 have been in the car while the driver was texting, and 15 percent of young drivers have seen their parents text while driving. Texting while driving can, and certainly has, lead to serious collisions. Depending on the severity of the accident, the crash can incur thousands of dollars’ worth of property damage, medical expenses, and emotional distress. Oftentimes, the best way to recover the full amount is to file a personal injury claim. 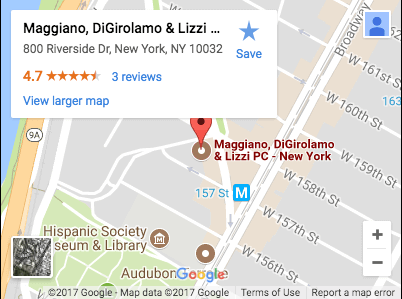 Maggiano, DiGirolamo & Lizzi are prepared to fully investigate your claim and fight for your compensation. Our team of personal injury lawyers have achieved a number of significant verdicts and settlements for victims of car accidents. With more than 80 years’ worth of combined trial experience and more than $300 million collected for our clients, we are equipped to handle your unique situation. If you or a loved one has suffered serious injuries as a result of texting while driving, contact Maggiano, DiGirolamo & Lizzi today. We are prepared to take on insurance adjusters and opposing attorneys alike to ensure you get what you are owed. Call (201) 585-9111 or contact us online to to schedule your free and confidential consultation today.